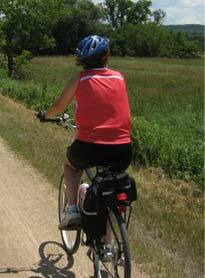 Join us TOMORROW MORNING for a "loops and lunch" ride at Busse Woods - approx 22 miles at casual speed - faster riders are welcome to ride ahead - we'll re-group at several locations along the way. Meet in the first parking lot off Biesner Rd behind Alexian Bros Medical Center by 9:15AM to sign in (ready to ride by 9:30AM). We'll do two loops around Busse (with a little extra along the way) and a lunch break on the second loop. Usual lunch stops there by 7 Mile Cycle. Questions? Feel free to call us at 1-847-891-2383 or (cell) 1-630-306-3153. Should there be any reason to cancel, we'll post that notice by 8:00AM tomorrow morning. Hope to see some of you at Busse TOMORROW MORNING. Howard and Anna.